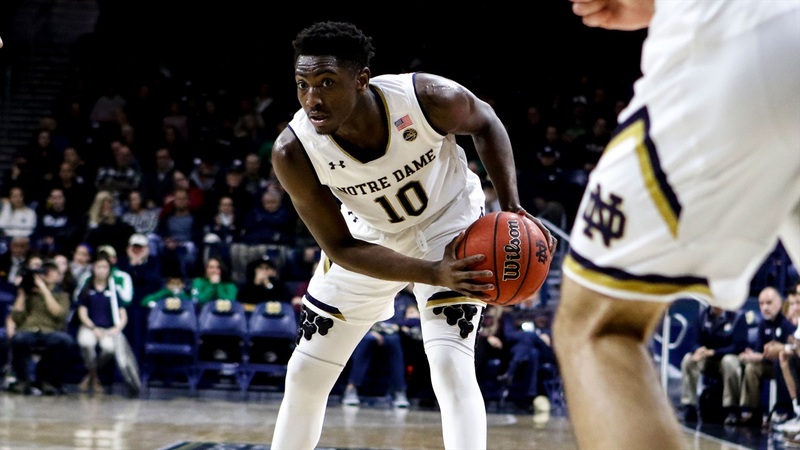 TJ Gibbs: "We can’t let this team slip"
The 2018-19 season has been one filled with ups and downs for Notre Dame. The Irish are just 12-11 and 2-8 in ACC play. While no one expected Notre Dame to contend for the ACC, Mike Brey’s team has failed to compete in two of the last four games. Gibbs knows the effort has to be better and remains positive the Irish can finish the year strong. “It is what it is at the end of the day,” stated Gibbs. “It’s a young group. We have some older players who are still finding their way. I’m still finding my way. I think every day is a learning experience for this team. We’re getting better and we need to put it together. Youth has been an excuse used by the program for most of the year and while there is substance to it, Brey needs his older guys to raise their game and it hasn’t happened. For instance, Gibbs shot 41% from the field and 40% from three-point range a year ago. This year the junior guard is shooting just 34% from the field and 32% from three. Gibbs shot 83% from the free throw line last winter and even that has dropped to 73%. Gibbs admits he has to focus on the game more and in the past, the veterans kept his eyes on the end goal. “I need to play within myself more,” said Gibbs. “It’s real easy to get away from that and not having older guys like Matt and Bonzie or VJ and Steve to look over my shoulder and have my back to keep in intact with the game. I have to do that myself and I have to do a better job with that. I have to do a better job of keeping the team steady and leading better. As a captain and one of the lone veterans in the program, Gibbs doesn’t feel there is pressure on him to perform better. However, one can see the expectations of making the NCAA Tournament are weighing on this team. “It’s not pressure,” Gibbs explained. “It comes with the territory of being at Notre Dame. We came here because we want to win games. We came here because of the prestige this program has and the back-to-back Elite 8s and the guys who have come through here. Gibbs is the guy the youth turn to for guidance, but who does the New Jersey native look to for advice? Colson and Farrell went through a similar struggle last season as Notre Dame battled a depleted roster and a long losing streak, but they brought up another low moment in their career when talking to Gibbs. “There are always going to be better days,” Gibbs said of his conversations with Colson and Farrell. “We talked about to their loss to Monmouth. I think it was the year before I got here and how they didn’t know where they were. They found their way. It’s going to take a little bit longer because we have a younger team, but at the same time, that’s what we’re striving for. We’re striving for our way.